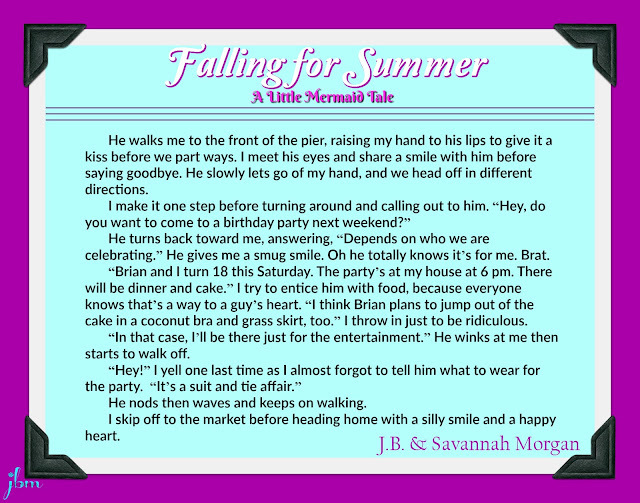 She finally has his attention but her cousin, Cassidy, doesn’t want Summer to be happy. Cassidy has always wanted what Summer has and now she wants Lucas. 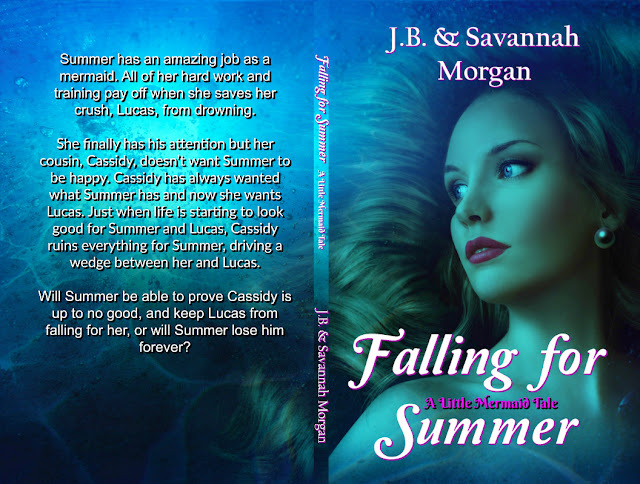 Just when life is starting to look good for Summer and Lucas, Cassidy ruins everything for Summer, driving a wedge between her and Lucas. Will Summer be able to prove Cassidy is up to no good, and keep Lucas from falling for her, or will Summer lose him forever? 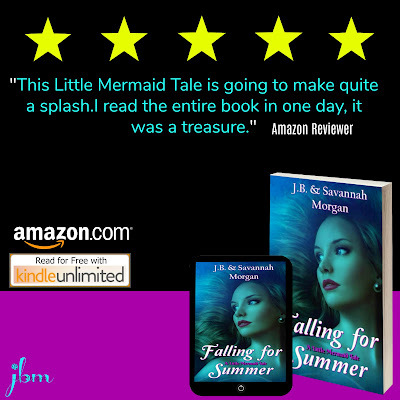 Let me start by saying that Ariel is my second favorite Disney Princess so, I was very excited to read this when I found out it was a Little Mermaid inspired tale. 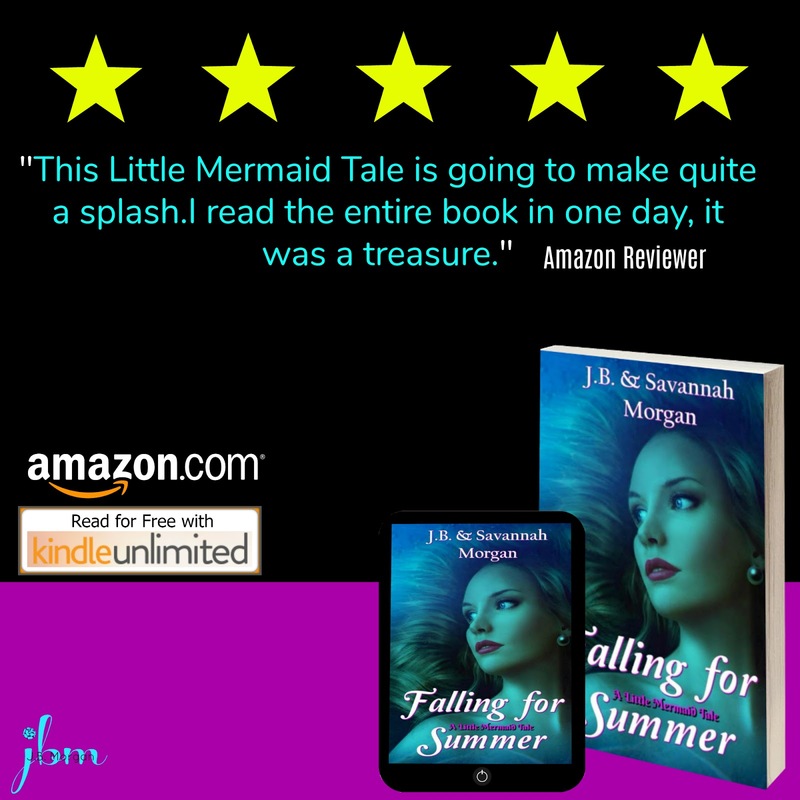 The authors, J.B. & Savannah Morgan, said that they wanted to write this, because Ariel has not been getting the same attention as the other princesses lately and they are SO right! It is very hard for me to judge this book, because it is a short story. I always have such a hard time reviewing them, because you have so little to go off of. I found this story to be relatable, emotional, cute and entertaining. Summer and her friends are "nobody's". They aren't in the popular crowd so Summer's crush, Lucas, has no idea who they are. Summer is struggling with her hopeless crush on Lucas and dealing with her spoiled brat of a cousin, Cassidy. I found this story, although short, to be really able to tell a good story. There was definitely a beginning, middle and end to the story so, the plot lines were well executed. I also found this story to be emotional. There is a scene where Summer is grounded and I found myself crying with her, because it was so ridiculously unfair. I could feel her despair for being so misunderstood. When a short story can really make me feel emotion, I am sold. I really enjoyed reading the story, but I did have a couple issues with it. The first thing that bothered me was that some of the things Summer said didn't sound like anything a real teenager these days would say. It kind of felt like the story really should have taken place in maybe the eighties or nineties, but yet at the same time you could tell it was present day so it just kind of threw me off. The second one is a little difficult to explain. I felt the story was a little too rushed. I know, I know it's a short story, but I felt like there was so much more that the authors wanted or tried to put in the story while still trying to keep it a short story that it felt too rushed in some of the scenes. This mostly happened in the middle of the story. Days were passing, but it felt so rushed. Then in bigger, more important scenes the pace would slow down. It was just a little jarring, because some scenes were done so well while others seemed too quick when they could have been drawn out more. I would have really liked to see this as a full novel. I think it would work really, really well and we would be able to flesh out the characters and scenes a little more. I really enjoyed this story. It was emotional, cute, relatable and entertaining. 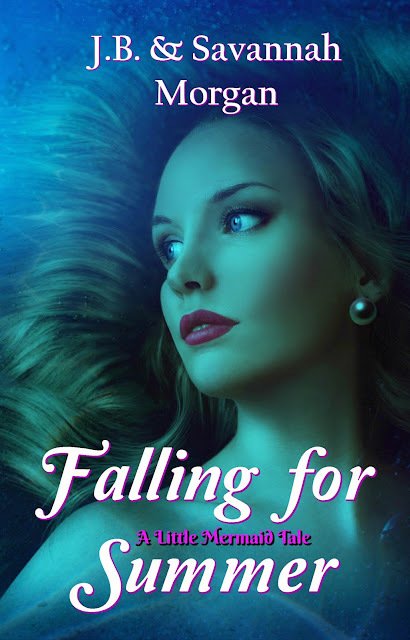 This story works well as a short story, but I think it would be so much better as a full length book, because then we could have scene the characters and scenes much more fleshed out. Although I really enjoyed this story there were two things that threw me off. 1. some of the things Summer and her friends would do or say didn't sound like how teenagers today talk or act. It almost felt like this story should take place in a different time besides the present. 2. Some of the scenes were just way too rushed. I know it is a short story, but there were some scenes where the pacing was perfect and others where I felt like I had whiplash. Overall it was a very cute story that I am happy I got the chance to read. 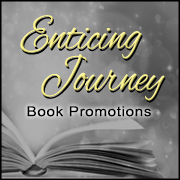 I would definitely read more from this mother/daughter duo and I hope you'll check them out too. 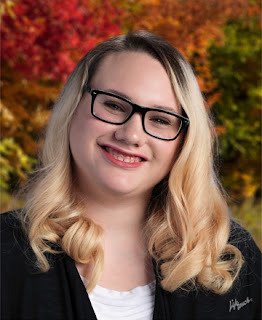 J.B. grew up in California, but now resides in Oregon where she’s a wife, mother, author, chocolate lover, and a Yankees fan. She also loves traveling the world. When she’s not writing, she can be found carting her kids everywhere, busy with volunteer work, or trying her hardest to read— without interruptions.